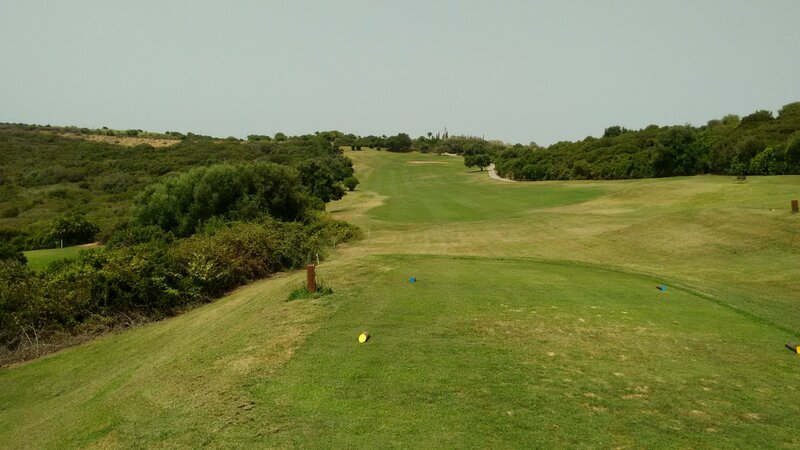 The Alcadeisa club has two courses - Links and Heathland. It sits about 5 kilometers East of Gibraltar and occupies a wonderful location at the bottom of a shallow valley that sweeps down to the sea. At the sea-shore there is a gently curving crescent-shaped beach several kilometers long. The whole development is about 20 years old, and was clearly intended to be large - effectively a small town. The property boom/bust put a partial stop to that development, so property surrounding the courses is not intrusive. The properties themselves are quite modest e.g. moderate-sized apartments and townhouses in 2-storey blocks. 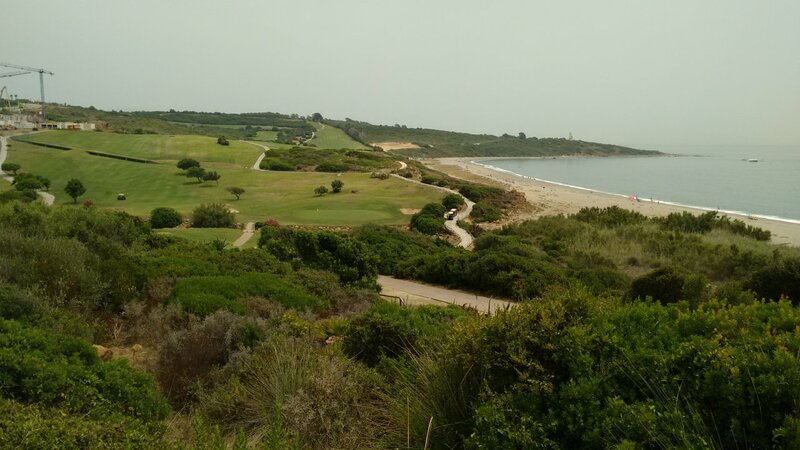 The key thing here is that they did not build properties between the club/courses and the sea, so the golf facilities thankfully got uninterrupted views out of the unique location. The clubhouse is large with simple modern design. The club has several hundred members, mostly British and German. Probably a 'local club' for people working in nearby Gibraltar. The golf itself is not expensive, particularly for visiting golfers. The food/drinks prices are moderately expensive, but nothing like the prices you can expect to pay at the super-premium courses nearby. The original valley around the Links course had very dense scrubby maritime vegetation, and they obviously went out of their way to preserve that where they could – rather than turning the whole area into one giant lawn. So the rough surrounding some holes on the Links course can be extremely tough (do not even bother to try to find an errant golf ball), but these are bits of pristine nature and I for one am glad of it. The Links course is oxbow-shaped running from the clubhouse down to the Mediterranean sea. The holes run in parallel in pairs – basically 1-9 out then 10-18 back to the clubhouse. So most holes have one adjoining fairway only. To be clear, this is not really a genuine links course. The 'Links' here really just refers to the sea-side location. 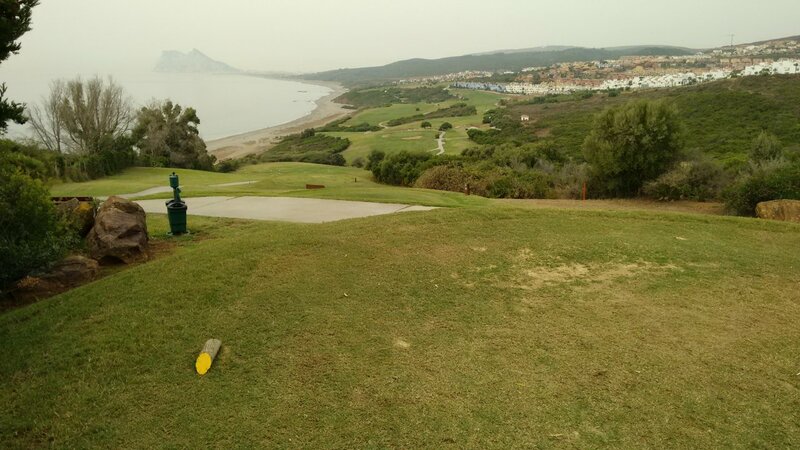 All holes have some view of the sea, and the middle holes in the round are very close to the beach (a hundred meters or so away). About half the holes have some elevation up/down towards the green, but only severe on 1 or 2 holes. The fairways are medium width and medium quality, certainly not excellent. A bit patchy, but no wiry grass, so perfectly playable. There are fairly detailed and accurate carved wooden hole maps on every tee. Tee boxes are average quality. A reasonable number of bunkers, some large. The sand in those is dense and fine-grained – not difficult to play out of. The location of the bunkers is as one would expect. Some guarding half a green, some on fairways waiting for an off-line drive. The greens are large. One or two have small sandy patches, but overall they are medium-paced, soft and consistent. As a mid-handicap player, I did not find this course difficult at all. Partly because it is quite short. I thought it quite a gentle course. There is not one single feature of this course that I can describe as genuinely tough. Where there is really wild natural rough, you have to hit quite a bad shot to find it. The line you want to play on every hole is obvious. A course where I absolutely expect to play to my handicap after I had been around it a few times. Low-handicap players I expect will find this course easy – will actually be clubbing down quite often simply because there is no real need to go for length to reach a green in regulation. High-handicap players might struggle a bit with uphill or downhill lies on some of the holes and the occasional hazard running across a fairway, but that really reflects their poor club selection rather than innate difficulty of the course. This course is a pleasure. Fun, definitely not a slog. What elevates this course above all else is its location. On a warm day without a breath of wind, playing this course will be absolutely gorgeous. The views out over the beach, bay and then on to Gibraltar are simply beautiful. Conversely because it is quite an open course and subject to weather coming in off the sea or from Westerly winds, it will be a lot less pleasant on a gusty or rainy day. A nice course for all golfers except the very high-handicap ones. A 'special situation' course for me. One to enjoy a relaxed round in the right weather, rather than a course that really challenges my game. I can understand the attraction of this whole club with several similar price and quality courses nearby (ignoring the 4 or 5 super-premium courses a short distance away). Certainly well worth the money for the cost of a round. A different course from virtually all others on the Costa del Sol. Nice.